Lighten the mood at your next event with this great product. The 14 oz. Mood Beer Stein is made of durable plastic and features a thumb grip handle for convenience. This fun item changes color with ice cold liquids. 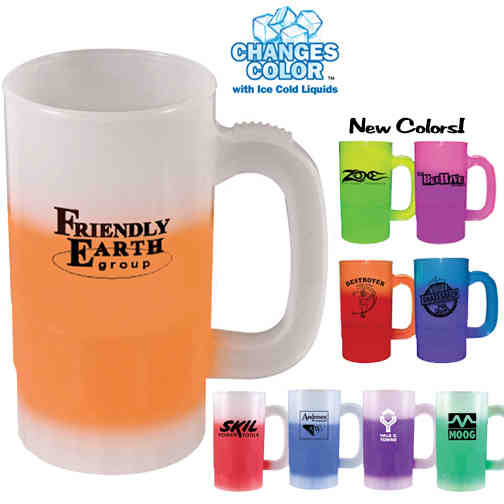 Available in 9 vibrant colors, select this cool item as your next giveaway during outdoor company picnics, parties or festivals. Top shelf dishwasher safe. Warning: Severe weather conditions may affect the mood change. Imprint Size:2-3/16" W x 2-1/4" H per side. Multi Color Imprint - second column break minimum for multiple color imprints.